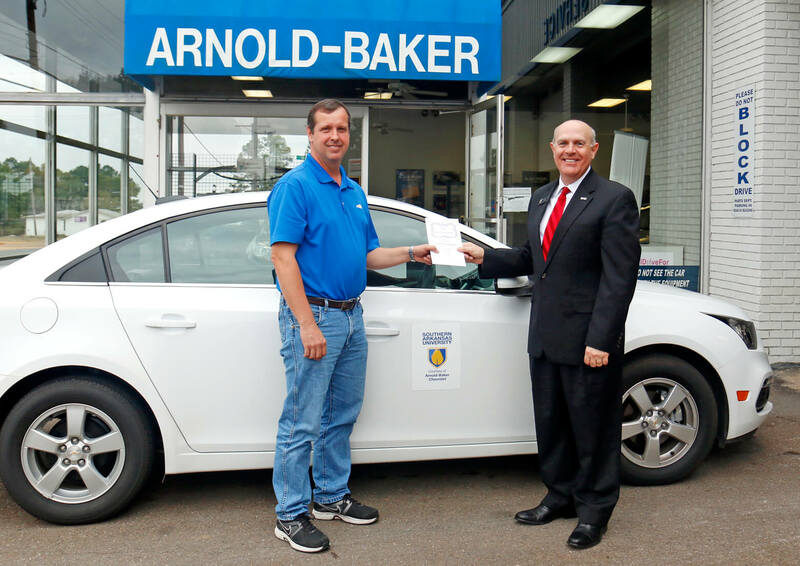 Arnold Baker Chevrolet in Magnolia is helping Southern Arkansas University save money in a unique partnership in granting a vehicle to the Office of the President at SAU. Thanks to Jimmy Arnold of Arnold Baker Chevrolet, SAU President Dr. Trey Berry has a vehicle for his traveling needs, which include trips to the Arkansas Capitol, meetings with SAU alumni and friends, and recruitment. “Southern Arkansas University is such an asset to the Magnolia community, and I am honored to be able to help SAU in this way,” said Arnold. Berry will be granted a new mid-sized car every four months or 7,000 miles. This saves the University not only on the cost of the vehicle, but will relinquish any service costs as well. Berry will simply reapply to each ride an SAU magnet recognizing Arnold Baker Chevrolet’s generosity of the University. “We are so grateful for this unprecedented gift to SAU from Arnold Baker Chevrolet. This serves as another clear example of how the community supports SAU and its mission. We appreciate this gift and all the support that Arnold Baker Chevrolet has given SAU through the years,” said Berry. Through such partnerships and alumni and friends’ gifts, SAU is able to keep costs down for students despite decreased funding from the state. In fact, SAU is the most affordable university in Arkansas, according to the U.S. Department of Education, and the sixth most affordable in the U.S., according to BestValueSchools.com.